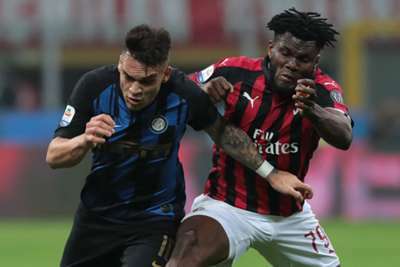 AC Milan midfielders Franck Kessie and Lucas Biglia apologised for an altercation between the two team-mates on the bench during Sunday's 3-2 derby defeat to Inter. Kessie had been withdrawn after 69 minutes and looked visibly irritated as he was replaced by Andrea Conti. When heading back to the bench, Biglia appeared to say something to Kessie and he reacted aggressively, requiring several team-mates to physically restrain him. The pair addressed the media afterwards and regretted the situation, with former Atalanta star Kessie accepting responsibility. "It was [down to] the adrenaline of the match," Kessie told Sky Sport Italia. "I was frustrated about coming off and wanted to do more. "I took it out on Lucas, which was a mistake. I apologised after. He is older than me and I should look to him to learn. I am sorry." Biglia accepted the two should have aired their grievances in the privacy of the dressing room, rather than in front of the television cameras. "Franck knows what I said and we clarified things after," Biglia added. "We all wanted to win, but this isn't something we should be doing in front of everyone. We should maybe save it for the dressing room. "Above all, we feel bad for this embarrassing situation. I feel ashamed and have apologised to the team and the coach personally. "It's not what we wanted. We embarrassed the club we represent. It won't happen again."